Whether you’re creating a new blog, landing page, or any other site content, keyword research is one of your first stops. Which is why we created a free keyword analysis tool. Today I’ll walk you through the Pagezii keyword analysis tool. I’ll show you how it works and why you need it. This gives you an idea of how our free keyword analysis tool works. Now let’s dive into each widget. And you’ll want to stick around. Because I’ll show you how to extract value from each. Keyword ranking difficulty shows you how tough it is to rank on page one for a given keyword. Keywords showing difficulty as “hard” or “very hard” are big game. They require a commitment on your part. A commitment to creating quality content. And not only that, but also a commitment to optimizing for the search term. So, here’s what you can do to rank well for these big game keywords. Spend time doing content research: Look at what how other sites are ranking for that keyword and build on their success. Optimize for your target keyword: This is where you mention your target keyword in important on-page elements. Promote relentlessly: Once you publish content, make sure to share it with online communities. And don’t shy away from sharing the same page multiple times. This is how you build social proof for high-vlaue pages. Build links to that page: And last but not least, cracking page one results requires legwork. This means building links to the page. Read this post for tips on how to build backlinks. Search intent analyzes the “objective” behind the search query. 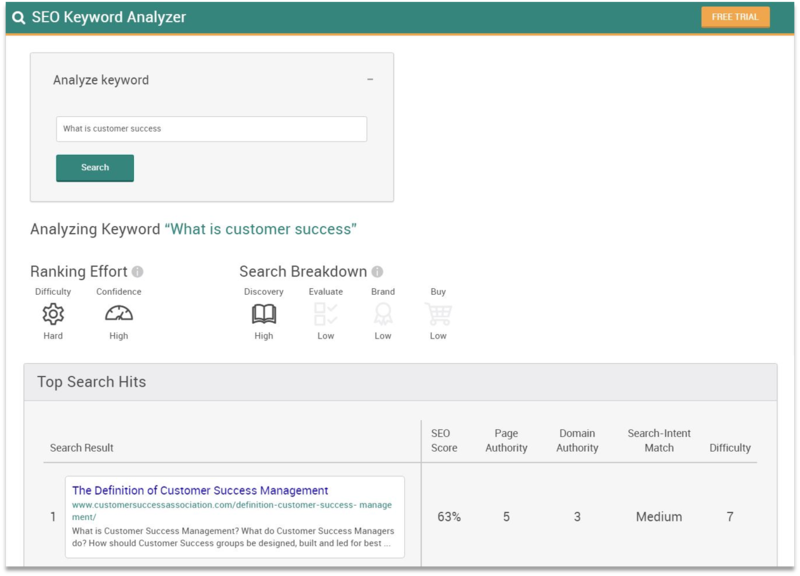 Pagezii’s free keyword analysis tool breaks down search intent into four categories. And this is key when it comes to tailoring content. In the image above, you see the search term “what is customer success”. The keyword analysis tool picked this up as “discovery”. And not only that, but there’s high association for that search intent. For discovery content, visitors are at the awareness stage. So, a blog post works well for this type of content. In your blog post, you could provide a complete run-down on Customer Success. Answering the initial question, and then dive 10X deeper into the topic. You’ll want to dive deeper because remember, this search term is difficult to rank for. So long form content will catapult you to authority status on the subject. There’s no need to mention your product early on. Save that until the end of your blog post. Here’s where you can direct visitors to a case study landing page where they can see a solution in action. SEO score is an overall grade for keyword use in important on page elements. Using Pagezii’s free keyword analysis tool, you can get an individual score for each of the top ten results. It’s going to show you how seriously your search engine competitors are optimizing. A common SEO myth is that just because you optimize your content well for a specific keyword you’ll rank on page one. I’ve had posts reach +90% SEO scores and still not crack page one. You’re giving yourself the best chance to rank well for a query. And an awesome SEO score combined with backlinks, high-value content, and social promotion is a recipe for success. Page authority shows the strength of a particular page. It factors in backlinks, current position, and a few other secret ingredients to score a page from 1 – 10. Page authority plays a big role when it comes to ranking well in Google. Because it can propel your content to top rankings despite having a lower domain authority (which we’ll cover shortly). Have a look at the example above. You can see that The Customer Success Association ranks above Wikipedia. Which is impressive in its own right. But it’s able to do this because of a high page authority. Domain authority is like page authority, but for your entire site. Pagezii’s free keyword analysis tool also shows you domain authority on a scale of 1 – 10. Let’s use the example above to break down domain authority. The Customer Success Association sits in top position with a domain authority of 3. Which means their domain relatively strong in their industry. And boosting page authority across their site is going to have a direct effect on domain authority. In position two we see Wikipedia. Which has an extremely strong domain authority at 9. This level of domain authority will almost always yield a strong SEO position. Which is why you see Wikipedia in top positions when they do generate a result. Why is The Customer Success Association outranking Wikipedia? Search intent match analyzes how well a particular search result matches the objective of a user’s query. our free keyword analysis tool shows search intent match as low, medium, and high. In terms of our “discovery” search intent, this headline is perfect. We asked Google what is customer success? And this result shares the definition. We see our exact query mentioned in the description. But it is modified as customer success management, which is why this is a medium match. Nonetheless, this is still solid search intent alignment. And this goes a long way for outranking powerful domains like Wikipedia. SEO Keyword difficulty factors in all our SEO keyword ranking factors to give an overall score from 1 – 10. You can use this information to understand how hard it is to outrank a particular result. Obviously the higher the difficulty score, the more effort you’ll have to put into outrank. But using the difficulty measurement, you’ll at least have an idea. This is how Pagezii’s free keyword analysis tool gives you instant value. Instead of deciphering a SERP and guessing which content is performing well, you now have data-backed difficulty scoring. The Google trends widget shows you search popularity over a given period of time. This widget is available for users logged into the Pagezii app. This data reveals when search terms we’re at the peak of their popularity. Let’s say you want to write a new blog post targeting “what is customer success”. You can use this data to determine that this term is relatively popular compared to its popularity around this time last year. If popularity was trending in the opposite direction, you should focus on different target keyphrase. 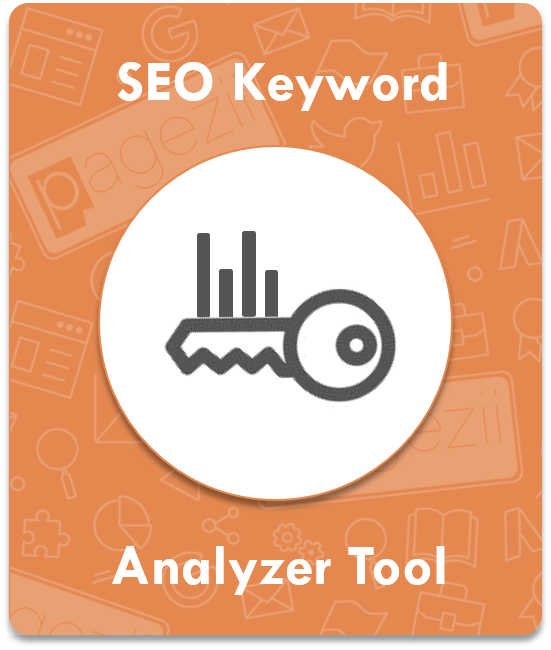 You now have the complete run-down on Pagezii free keyword analysis tool. So now it’s time to give the SEO keyword analyzer a test drive. Simply enter your keyword or keyphrase, and get detailed SEO competitor analysis.